England which has neglected its beliefs. Laugh-aloud satire is mixed with moving passages about the human condition and even a fairytale love story. Quentin Letts is parliamentary sketch writer and theatre critic for the Daily Mail. A regular broadcaster on radio and television, he was formerly New York correspondent for The Times and gossip columnist for the Daily Telegraph. He recently presented Radio 4's series 'What's The Point Of? 'This is his first novel. Letts has found a rich lode for the Speaker's Wife, mined his material deftly, minting a medal of a book. Hilarious! Can't wait for the next one! 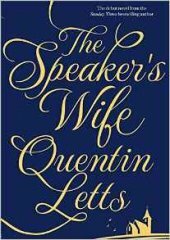 The speakers wife, a great read. Great! Let's have some more please. Hard tp put this flowing tale down. Superb craftsmanship makes this a special experience. Quentin Letts is a brilliant and incisive wit. I hope we gat more clever and amusing books from him. First class writing. Terrifically imaginative and compelling. I think it is fantastic!!!! Very well written with lovely style and techniques in the writing. This is a great example to define an excellent first novel. Highly entertaining. So much fun. Would make a terrific film. A masterful, engrossing novel, dipping into politics without putting the reader to sleep is heroic, with a rich, ocean of characters and dialogue as crisp as a winter blizzard. Wondeful stuff. Letts' writing talent knows no bounderies. An excellent journalist and theatre critic -- even if one does not agree with his views. Hope he follows with another novel as good as this one. Beautifully written and so much fun.